This colourful little playground was donated to give children a space to play when Glebe was still regarded as an overcrowded slum, by a great ballerina, one of the leaders of the arts scene during and after World War II. The walk begins at this small park behind Glebe Library. You can reach it by walking along the path between the Library and St Helens, then crossing the carpark. Alternatively, turn left into Wigram Road from Glebe Point Road and left again down Wigram Lane. In either case, be on the lookout for vehicles accessing the carpark and lane. Hélène Kirsova (born Ellen Elisabeth Kiersten Wittrup, Denmark, 1910 – died London, 1962) donated three pocket parks from the profits of her Kirsova Ballet Company. The other two are in Erskineville. This company was itself an offshoot of Colonel De Basil’s Ballets Russes de Monte Carlo, which in turn originated from the group drawn from the Imperial Ballet of St Petersburg formed by Sergei Diaghelev after the Bolshevik revolution. Diaghelev transformed a moribund dance form into the cutting edge of twentieth century performance art by commissioning works from the leading artists and choreographers of the day, including composers Igor Stravinsky and Ravel and painters Matisse, Picasso, de Chirico and Braque, amongst many others. The National Gallery in Canberra has a huge collection of costumes and other artefacts from this ballet, plus an extensive archive on Kirsova. Kirsova was the prima ballerina with the Ballets Russes tour of 1937-39, and elected to stay in Australia, with a number of other ballerinas, with the outbreak of World War II. She formed her own company, and was a leading figure in musical and artistic circles in Sydney during and after the war. Clearly she believed her gift of playgrounds would improve the health of young children in the inner City, then at its social nadir. The majestic fig at the rear of the playground is a Heritage Item assisted in its growth by the stables at the rear of houses in Hereford Street. Kirsova No 3 is especially popular for birthday parties for small children, and because of the Toy Library located at Glebe. 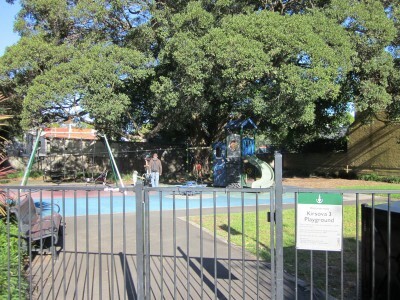 The City of Sydney installed new play equipment in 2005. Return to Wigram Rd, turn right and continue to the wisteria walk and small park in front of Glebe Library.